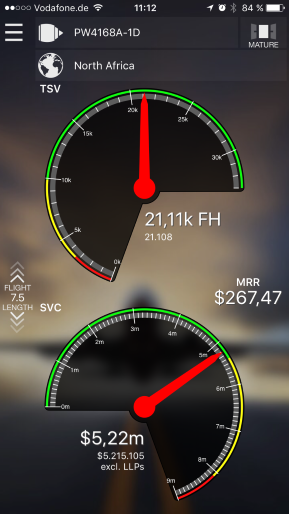 Our engineers at Royal Aero are pleased to announce the arrival of our new MIDAS-severity® App. This application provides customers the ability to calculate the predicted life of aircraft engines in the palm of their hand, from anywhere in the world. How long will my engine last on-wing? How much do I need to reserve for the repair? MIDAS-severity® has been designed to help people find answers quickly, saving valuable time, money and energy in the portfolio acquisition analysis and lease negotiation process. We, at Royal Aero, hope you will find it helpful. The MIDAS-severity® App is powered on a real-time basis from Royal Aero's MIDAS® Engine Management Platform, which is used by several of the world’s leading aircraft lessors to manage their fleets. Download the App by connecting to your preferred App Store and search for 'Severity'. If you would like to find more about our engine consultancy services, our MIDAS® Engine Management Platform or obtain open access to the full version of the Severity® App, please contact our Engineering VP Sales and Marketing, James Peck, at our UK office from the contact link above.